When I was born the doctors told my mom something was wrong but they didn’t know what. Turns out, I was born without the tibia bone, my fibrosis bands were too short and my foot was laying on the side of my leg. The doctors gave my mom the option of leaving me in a wheelchair until I was 16 or at 18 months they could amputate my leg below the knee. She was told that I would never run, ride a bike or “be like” any other kids but I could get from point A to point B without help and I would have a bad limp. I thank God and my mom for choosing the latter. I grew up with a determined attitude that I could do anything that anyone else did and fell in love with sports. In junior high, I played volleyball, basketball, track and was a cheerleader. I began lifting weights in junior high and fell in love with it. I was the smallest thrower in the state for shot put and discus so I had to be the strongest. In high school I played volleyball and track. I received a track scholarship and went to EWU and was ranked in the top 10 of the big sky conference. While writing a college paper on amputee athletes, I found out there were competitions for amputees all over the world. I was invited to compete in Canada from the president of the amputee athletic association. I have to admit I thought that wouldn’t be fair since all I ever competed against were “able-bodies”. I decided to participate and it changed my life forever. There were serious athletes around the world that were amputees. I won 8 gold medals that week and broke 7 world and American records. I was hooked. After college, I continued to compete in several Paraolympics, world Championships, sports festivals and traveled around the world competing in both track and field and volleyball. Once I had my child, I competed for a few more years but at a very early age my son decided he loved sports so it was his turn to shine. I stopped competing in 1998 and let my son take over the family fun of sports. Now that my son is in college on a basketball scholarship, I decided it was time for me to get back into shape and start doing things for myself again. 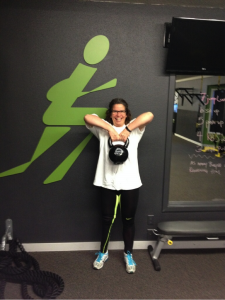 Keane and I work at the same school, so I had heard about Studio Fitness from several people. It has taken me quite some time to move on from some difficult life situations but with the grace of God, supportive friends and family, life has begun again for me. Studio Fitness has helped bring back my love of fitness and self confidence that keeps me going every day. Life is a journey we all must take and our attitude determines which way we go. I love the energy and the people I have met at Studio Fitness. Thank you for allowing me the opportunity to become a member and find new friends and muscles I thought I’d lost forever. Positive attitude produces positive results!